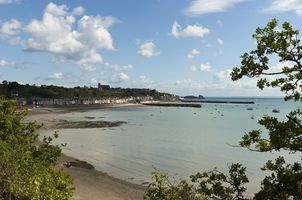 Dog Friendly Holidays ~ Thinking of visiting Brittany with your Pet. 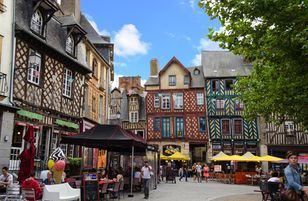 Thinking of visiting Brittany with your Pet. A visit to Bettineuc's nature park with lake and forest walks. Enjoy the walks around 'Treverien' our tiny village, the lakes, canals and pathways around the countryside. Visiting Bobital, walking through the forest and swimming in beautiful, calm safe lakes. Our Gite is perfect for dogs with it's own private garden and entrance. (Our Bed & Breakfast accommodation is not suitable for dogs). We have a cat and 3 dogs they are friendly, well behaved and sociable. Moose "will I won't I"
Phebie & Kaspar swimming as Harry 'has a good shake"
Acer saying come on Mum we're all ready to climb the hill !! Our vet is Dr Etienne Ferry his practice is in Evran which is approximately 4 km from Les Maricotais. We have found that his staff are always very kind and helpful. If we can help by arranging the appointment needed for your dog/s return journey to the UK. Please let us know, we are only to happy to telephone and make your appointment. Centre: Veterinaire d'Evran, Dr Etienne Ferry, 10 rue Les Granges, 22630, Evran. TOWN: You should always keep your pet on a lead in public areas and please remember that you must always pick up after your dog. For information on the location of Poop-scoop bag dispensers or dog toilets please contact the 'Office de Tourisme'. BEACH: Dogs are not allowed 'at all' on some beaches. Others only allow dogs in certain areas at certain times. and they may also be banned from the sea/canal/river ! It is very important to check which restriction apply to the beach of your choice. IDENTIFICATION: MICROCHIP OR TATTOO ! ID is required in France for dogs over four months old and cats over seven months old. Having pet ID is really important just in case your pet runs away or disappears. VACCINATIONS: 'legal obligations' From 1st January 2009, the European Pet Passport is the only document that can be accepted as proof that dogs and cats have had their anti-rabies vaccinations.